In a short time, Coach Gedman has made a name for himself as a hitting coach. 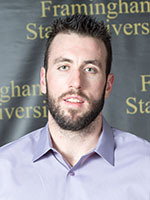 Before taking over the Framingham State University program, he was the hitting coach at Bryant and consistently had their offense at the top of the conference in various power numbers. Coach Gedman was a standout at UMass both on the mound (led team in ERA) and at the plate (batted 0.314 and led team in HRs). Through his hitting background, he will be speaking to the MBCA on how coaches can build a productive lineup for their program.